As a current Director of the Coastside Fire Protection District and one who has been involved with emergency services in this community for over 30 years, it is my pleasure to heartily endorse Bruce Mackimmie for the open seat on the Board. I’ve known Bruce for over 25 years and find him to be a straight shooter. He served previously on the Fire Board and led the charge to bring Cal Fire to the coast and merge the Point Montara and Half Moon Bay districts. In addition, he drove the successful board action that reduced fire taxes for homeowners. Bruce’s only agenda is superior emergency services at sustainable cost to the citizens of the district. I urge you to vote for Bruce Mackimmie. A year and a half after the bruising Fire Board recall, we’re operating under an unprecedented seven-year contract with Cal Fire, and the issue has faded into the background as public attention shifted to two bridges, the Harbor Board and now the City Council election. But protecting the Cal Fire partnership is still critical to our community’s safety and financial stability, and the upcoming election for the open Board seat is therefore important. Fortunately, there’s one outstanding candidate for the position. Bruce Mackimmie. Back in 2006, Bruce – then board president of the old Point Montara district – was one of the first and strongest voices for bringing in Cal Fire for our public safety services. As a retired firefighter, Bruce was an unlikely Cal Fire advocate because it meant closing down the department he had so proudly served, but he recognized early that the old standalone model no longer made economic sense. Bruce portrays delivering Cal Fire as a team effort – six directors on two boards voted for the change – but it was Bruce who was the public face of the cause, speaking out and writing Matters of Opinion to explain the issues to the voters. Time has proven Bruce’s judgement correct, and the Coastside has endorsed it in the most emphatic possible way. When the Cal Fire contract was trashed by three errant directors, the voters recalled them in a landslide and elected a unanimously pro-Cal Fire board. Because Bruce helped craft the Coastside’s relationship with Cal Fire, he is by far the most qualified candidate to protect it against those who still oppose it and hope to subvert it. Bruce has stood strong to make the best choices for the community even against intense opposition, and he has displayed the unfailing poise and dignity to represent us appropriately. His eagerness to serve again is something we should welcome and support – and vote for. As to Bruce’s opponents… Mike Clardy opposed Cal Fire and worked against the recall. He is supported by recalled former director Mike Alifano. Enough said. Bill Kehoe has been a confrontational critic of the current Board, the one we just elected last year in the recall. Most of us think this Board is doing a terrific job and celebrate the new spirit of amity even amidst disagreement. Kehoe’s bellicose approach is one of the things we voted against. The choice is clear. The candidate who is endorsed by current directors Gary Burke and JB Cockrell… the candidate who paved the way for Cal Fire… the candidate who has repeatedly shown his courage, his class and his commitment to the Coastside… is the one who belongs in this seat. Then there are the metaphorical bridges that must be built. Take, for example, the Coastside Fire Protection District situation. A recall election has been set for April and three duly elected directors may be shoved out of office. They brought that fate upon themselves by ignoring the obvious (that we have top-notch service at a fair price) and putting the district into reverse, toward another dysfunctional, expensive, crony-filled department operated by, well, them. However that plays out, we’ll ultimately have to build a bridge on common ground. We all have an interest in affordable, professional fire service. A recall election for the three seats held by the Coastside Fire Protection District Board’s majority, Mike Alifano, Doug Mackintosh, and Gary Riddell, will take place on April 9. The issue that prompted the recall election is a major policy change to go back to a more costly and trouble-prone stand-alone fire department. A stand-alone fire department will cost the community somewhere between 50 percent and 70 percent more to provide the same level of fire protection that we have currently from Cal Fire. It appears to me that the reason for the change is so that the Board majority can have more authority in day-to-day operations. A public Board of Directors is responsible for policy; it is not qualified to run the daily operations of a fire department. The primary failing of the current Board majority, is that it does not understand its responsibilities. Having once served as a firefighter or a paramedic, or even as a small business operator, does not qualify anyone to run the day-to-day operations of a fire district. This misunderstanding has been underscored recently by the members’ inappropriate behavior since the recall election petition succeeded in requiring this change to go to a vote of the public. The three board members announced their intent to make this major policy change a year ago last December and after an uncontested election in which this intension was not announced. At every meeting since last December’s, a growing number of constituents have asked the board not to make this costly policy change. These requests have fallen on deaf ears. The Board majority’s justification for the policy change is that Cal Fire’s services are inadequate. The San Mateo County grand jury investigated this claim and found no evidence to support it. The grand jury recommendation was for the Fire District to continue its current policy and for the Board majority to desist from its plans to form a stand-alone department. The grand jury noted that Cal Fire is providing fully adequate fire protection services and has saved the community millions of dollars over the last five years. Saying “no” to this major policy change is the rationale behind the recall election. If the recall petitioners win this election, there will be a different Board majority on April 10. A new majority will continue with the current policy of outsourcing fire protection services to save tax dollars. For the past five years this policy has been extremely successful. In their last meeting of 2012, the majority recklessly put in motion a process that will mean that, starting next July 1, our community will be without fully qualified fire protection services. This irresponsible act underscores how unsuited and unqualified these three individuals are for public leadership. Sensible leaders would have at least awaited the outcome of the recall election before pulling the plug on our current model for fire protection. This decision has elevated the issue to a new and dangerous level. These three directors all deserve to be removed from office. Jim Larimer is a resident of Miramar. There is now a date to determine whether three members of the Coastside Fire Protection District board will be recalled: April 9, 2013. 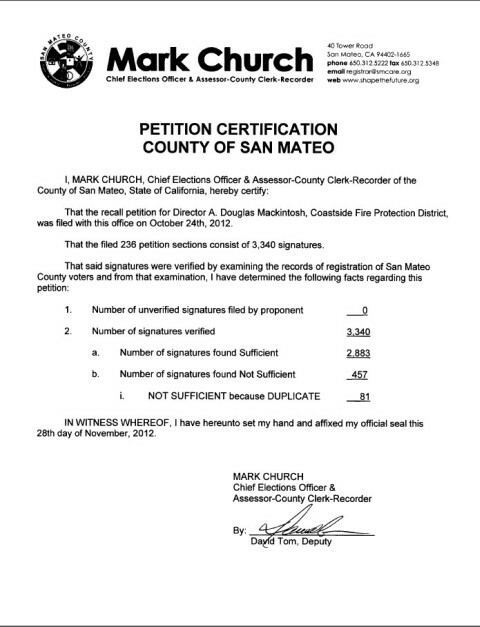 As far as San Mateo County Elections Deputy David Tom can remember, it will be the first recall election in the county in recent memory. President Doug Mackintosh, Director Mike Alifano and Director Gary Riddell are all facing recall. Critics say they lack transparency as they seek to terminate a contract with current fire protection services provider, Cal Fire, and to pursue a more expensive, independent department. They counter that they only want what’s best for district taxpayers and that Cal Fire hasn’t delivered on promises. Elections office protocol required governing board members — including those facing recall — to select a date between 88 and 125 days after announcing that the election would take place. During a special meeting on the evening of Dec. 12, Director Gary Burke proposed that the election happen as soon as possible, on March 12. “To delay it, to me, doesn’t seem to be in the best interest of the voters,” said Burke. Alifano requested the date be pushed back into April. As with most decisions of late, the vote was 3- 2. The majority, made entirely of members facing recall, voted to have the election take place at the polls rather than through the mail. That will be $55,000 more expensive than the mail -in ballot option. Regardless, Tom said that vote-by-mail is an option for all elections. Voters have the option to return the ballots by mail or drop them off at the elections office or at the polls. Anyone who is in the Coastside Fire Protection District is eligible to vote. HALF MOON BAY — The San Mateo County Elections Office has certified the recall petitions for three members of the Coastside Fire Protection District, and an election will be held next year. An elections official delivered the certifications to the board at its meeting Wednesday night in Half Moon Bay. The board will convene a special meeting Monday to decide when to hold the election. 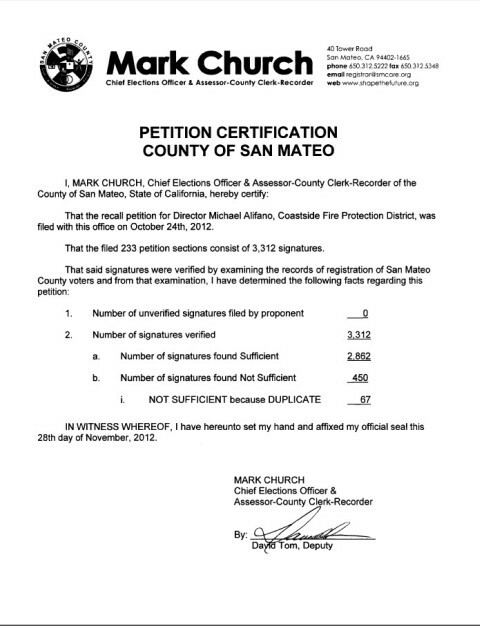 A group of citizens collected a total of 9,983 signatures to recall board members Mike Alifano, Douglas Mackintosh and Gary Riddell over their push to sever ties with Cal Fire, which since 2008 has provided fire services for Half Moon Bay and several nearby coastal communities, and re-establish a local fire department. The three men argue the state fire agency has not lived up to its contract. “These directors have spent over $170,000 on consultants trying to create a new stand-alone fire department and they have almost nothing to show for it,” said Marshall Ketchum, a leader of the recall campaign. Alifano said Thursday he is looking forward to the recall election, which will pit the incumbents against a slate of fresh candidates. County Elections now has 30 business days to verify the signatures. The color selection was completely arbitrary.